The last of five gold artefacts hidden in Scunthorpe as part of an artistic treasure hunt has been discovered. Beckie Allen, from Grimsby, found the replica ammonite shell at the base of a fence post in Scunthorpe's High Street East. The objects were hidden by artist Luke Jerram for his installation Treasure City, with clues placed in paintings at the 2021 arts centre. Mrs Allen said her husband and two daughters helped to solve the mystery. The art centre said she was "the first to spot secret dots" in a white painting in the gallery. Mrs Allen then followed the clue and found the golden shell hidden outside Italian restaurant San Pietro. "I spotted something that looked a lot like discarded litter at the base of a fence across the road from San Pietro," said Mrs Allen. She said her daughters "did the honours and opened up the velvet bag to reveal the final piece of treasure". The event, which is part of an art exhibition at the centre, started on 18 February. 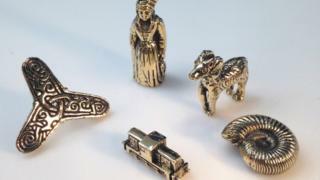 All five objects are replicas of pieces at North Lincolnshire Museum and were made from gold worth £1,000, but could be worth much more. People had to study five paintings and solve the code within them to find and keep the artefacts. The fourth item, the golden train, was found by a family from Grimsby in Scunthorpe's Central Park on 24 February.